'Tis the Season.... to kill! That's what this Santa seems to being thinking anyway. 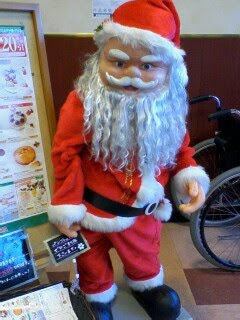 God what a scary Santa; he's enough to give you nightmares. (Found at the entrance of my local supermarket BTW). Hakuho just won his 12th total and 4th perfect tournament yesterday! He also set a new record for the most victories in a year with 86, beating Asashoryu's previous record of 84. It looks like the era of Asashoryu has ended and the era of Hakuho has begun!